Our music is an offering in talent and service to God, our Creator and Lord. 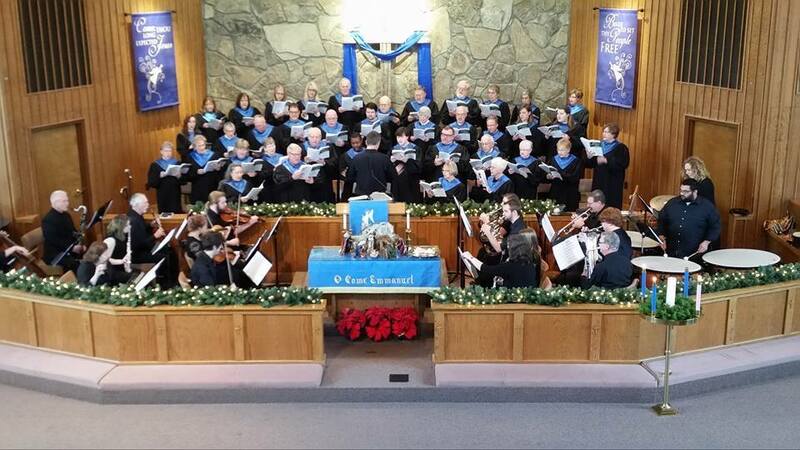 FUMC’s Sanctuary Choir provides an opportunity for adults to sing some of the great musical literature of the church as well as some of the best contemporary music written for worship. Rehearsals are Wednesday evenings from 7-8:30 PM in the Choir room, located behind the Sanctuary. 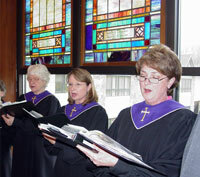 The choir performs several special presentations throughout the year, including an Easter Cantata, Christmas Cantata, and special worship services such as Maundy Thursday and Ash Wednesday. They also perform at various community events. If you are interested in joining, please talk to Jeff Bauman or just show up at Wednesday rehearsal! Overflow, the Praise Band provides the music to the 9:45 am Contemporary ‘The Well’ worship on Sunday mornings in the MAC If you are a singer, guitarist, drummer, etc., please talk to Eric Miller, the Well Music Leader, about joining. The Handbell Ministry is an opportunity for a small group to add to their musical training. Rehearsals are Wednesday evenings at 6 PM. Ringers must attend all rehearsals. The bell choir performs regularly at church services throughout the year, and has a community outreach that includes performances in local parades, at nursing homes, the senior center, and the Branan Lodge.